Is your mouth getting you in trouble? This time of year we can get into a lot of trouble with our mouths. What goes into them can so easily be too much, too rich, too sweet or too inebriating. What comes out of them might be thoughtless comments, backhanded compliments or casual remarks that are way off the mark. One way to stay out of trouble is to avoid all social gatherings for the duration. But if we do engage, do we have to stand guard, inspecting all content coming in and going out with a careful eye? Ugh! Where’s the fun in that? Fortunately there is a way to stay out of trouble with our words and our eating without declaring ‘Bah humbug’. Compassionate noticing is joyous, not a duty call or an inner police state. The Buddha called it Wise Action and Wise Speech. Wise Action during the holidays means being present in our bodies, finding balance, resting as needed, and gently stepping away from the buffet table when we are not hungry but find we are grazing to pass the time. We can wake up out of autopilot and really enjoy the party! Wise Speech invites us we use three questions to gauge whether speech is indeed wise. All three need a ‘yes’ answer for our speech to be wise. Of course not. In my own experience her words are truthful, kind and timely, and I would bet that is more often the case than not. But hearing this set of questions can sound daunting, so I’m sympathetic to her concern. But why are we ever motivated to say things that are untrue or unkind? We may be under stress, worried about something, in a hurry, reacting to a perceived slight, or blaming a loved one for our own grumpy mood. With family there can be a river of long-held gripes running just under the surface, so these gatherings can get out of hand quite easily. We may balk at the idea that we need to be mindful of our words. ‘I just want to be me,’ we say. But is mindlessness who we are? Is unkindness who we are? Is saying untruths who we are? Really? Of course not. When we speak mindlessly we are most often not speaking from our true selves but repeating some social patter we’ve heard somewhere just to fill the space and pass the time. The ‘filters’ of truth and kindness are ways of finding our own authentic voice, not quashing it. The question of whether what we are about to say is timely really has to do with being present with what’s going on. We take a moment to notice that the person we want to speak to has their hands full at this moment and would not be able to pay real attention. Or we may realize these are words for a private conversation and think better of blurting out something in the group. Finding the right moment doesn’t have to be a monumental task, but considering timeliness helps to insure a more productive conversation. ‘What is my intention here?’ You might notice any sensations in the body — tension, for example — that indicate you are probably motivated by fear. Not much good comes from fear. We tend to make enemies. We feel we need to defend our isolated sense of self so we use our speech as as a sword to ‘protect’ ourselves. It doesn’t work, of course. It just makes us feel more isolated as people pull away or attack in kind. Another motivation can be exposed with the question ‘Am I trying to prove something?’ Maybe some sibling seems to have it all together, and it feels important to be heard and seen as the accomplished person you are. (Remember not to compare your insides with their outsides. You present a pretty polished surface too.) That’s also a good question to ask yourself when you find you are doing most of the talking. If people’s eyes are glazing over or their looking away, you may be thrusting information that was not requested and pontificating about something just to show how much you know. ‘Is this my story to tell?’ is a useful question that helps to curb gossip. All information we receive is not fodder for conversation. Sometimes people share personal information with us and we are not meant to pass it on! It is not necessarily a secret, but it is just not our story to tell. Much as we may want to ‘fill the void’ by sharing stories about others to mutual friends or family members, it’s really a destructive pattern. But if not everyone is able to attend a family gathering, then what are we supposed to say when Aunt Sarah asks after her absent great nephew? Maybe it would be skillful to anticipate that there will be such a question and tell the one who plans to be absent that if he doesn’t want you to share his contact information with relatives, please provide some (true, kind) brief answer for the question of how he is doing so that you can feel confident you are not speaking out of turn. If none is forthcoming, fall back on, ‘Oh he’s fine.’ and if the probe continues, smile and ask the inquisitor a question. When being mindful of your words in general, you can also look more deeply at the first question ‘Is it true?’ Your first response may be, ‘Well of course it’s true!’ but if you look a little more deeply you might see that we don’t know for certain if it is true. Investigating the truth of what we hear and read, seeing things in context, considering the source, and trying to see the bigger picture are all useful activities when we are looking at information. If we are going to repeat it, we don’t want to do so mindlessly, just passing on fabrications, urban myths or unfounded rumors. In an election year, it is especially easy to align ourselves rather mindlessly with the candidates who we assume represent us, without questioning what we really believe. Sometimes we talk just to avoid ‘awkward silences’. You might ask yourself, ‘Can I be at home in silence?’ It is often our discomfort with silence that prompts us to say just about anything to keep the conversation going. We get so myopic we don’t recognize how much else is going on besides conversation. When silence arises try resting in it, deepening into noticing sensation. What is present in this moment besides words? A relationship that only has words to bind it is waiting for a deepening that resting in silence can bring: a smile, a pat on the back, a hug, a look, a sensing into the emotional state of the other person. All these questions are not to make us uncomfortable with speaking. They help us develop language that has more meaning, resonance and connection; and less misunderstanding, boredom, hurt feelings and confusion. When we pause in our obsessive need to fill the supposed void or to prove that we exist, we might find that the best form of speech of all is really listening. Less focus on monitoring the mouth, and more on activating the ears! May all these suggestions help you further enjoy your holidays. This entry was posted in holidays, Right Action, Right Speech, social anxiety, Wise Action, Wise Speech on December 13, 2015 by Stephanie Noble. I couldn’t end our exploration of the use of words without visiting poetry, for poetry is the natural outpouring of the meditative mind, a mind that is present, clear, fearless and filled with tenderness for all life. I am fortunate to be a member of an ongoing class at the College of Marin called ‘The Poetic Pilgrimage.’ Together, under the tutelage of Prartho Sereno and Catlyn Fendler, we read selected poets, both current and ancient, and then are given prompts to inspire and free us to hear the words that rise up within us and to write poems ourselves. We are training our minds to notice. Likewise, in meditation practice, we are training our minds to notice whatever arises: the physical experience of being, what we see, hear, smell, touch, taste with our senses, our inner commentary, the judging of that inner commentary. And we do metta practice, sending universal loving-kindness to whatever arises — to others and to ourselves. And in that process, over time, we find we soften, mellow, sweeten, deepen, lighten, and are enriched by this ongoing being. “All I was doing was breathing” is a poem title by Mirabai, a 15th century north Indian poet who considered herself married to the god Krishna. All we are doing as we meditate is breathing. Or more accurately, noting the breath, because there is no effort in the breathing. As we rest in the simple state of being, we create a space for compassion, gratitude, appreciation, joy and generosity to well up within us. Poetry is often a journey of inquiry, experienced in a state of wonder, the state we are in on a meditation retreat, more and more as each day goes by. Both poetry and meditation deeply notice of what is present in this moment, in the world around us and in the thoughts and emotions that traverse through our consciousness. Poetry is not afraid to explore in a compassionate way that which is bitter, difficult or ungainly. Poetry unmasks, dissolves obscuring filters, and sees with fresh tender eyes. As it happened, in meditation class last Thursday, our weekly reading of our Pocket Pema Chodron focused exactly on this. (We read these brief chapters, after meditation and before the dharma talk, in sequential order without regard to the dharma topic. Usually they lend some extra dimension to the discussion, and in some cases, like this, the reading could not be more aligned if I had purposely chosen it.) It was Chapter 44, titled ‘Gloriousness and Wretchedness’. Pema says there is value in both the gloriousness and wretchedness of our life experience. One inspires us and the other softens us. The more we meditate, the more we let go of the need to know definitive answers because we recognize that to live in the wonder is the gift itself. To incessantly be seeking out answers is just part of that useless activity of shoring up our defenses, wanting control, wanting solid ground to stand on. One of my favorite retreat experiences was the realization that I don’t know. All these assumptions I make about myself and the world around me are totally for convenience. I remember how I looked at the concrete under my feet during walking meditation, and I realized I knew nothing about most of it — only a small portion of it was exposed, and I didn’t really know all that much about that! I suppose it could have been scary to discover I don’t know, but in fact it was liberating. It was delightful. Contained within it was the realization that all the struggles we make to know everything are exercises in futility that we can just release. This is not to say that we should give up the pursuit of knowledge, but we can enjoy the process a lot more if we do it with awe and wonder, rather than a driving need to uncover, expose, conquer and claim. So much of poetry is written at a moment when the poet is simply looking out the window at an ordinary day and seeing the gift of this life. There is a Buddhist saying that to be born into human life is as rare as a turtle surfacing within a circle the size of a life preserver floating in the vast ocean. Scientifically this is certainly true for us. Think of all the causes and conditions of all our ancestors that had to happen in order for us to have this chance to be here. The mind boggles! The mind at rest, not striving, not in fear, can recognize the gift. On a silent meditation retreat, by day 4 the faces of retreatants glow with gratitude. Awakening to ‘this, just this…ah, bliss’ is simply a recognition of the gift that is this life, regardless of the causes and conditions. Any human, in any condition, even the most horrendous, can experience this joy. It is not purchased, it does not come with possessions or comfort. It comes from within, from awakening. We wish for all beings to be fed, housed, clothed and cared for. And hopefully we take wise action to help make that so. But even in the midst of great challenges, we can awaken to great joy and sing praises and feel gratitude, not for things but for the gift of being alive in this moment. Let me share with you these links to some of the poems we have read together. This entry was posted in poetry, Wise Speech on December 14, 2013 by Stephanie Noble. You can see from our past two discussions that Wise Speech is not just about talking. It’s also about developing a comfort with a quality of loving silence and developing the skill of really listening to others. Many Americans among blog followers had the opportunity to test these skills last Thursday on Thanksgiving with family and friends. How did it go? What did you notice? If you found yourself in the hot water of the sea of misunderstanding, don’t despair. Take notes! That was the test run. Chances are you have more social gatherings ahead! One student reported that her Thanksgiving was so joyful because she spent more time resting in silence and less time thinking she needed to speak. A friend recently reminded me that I once said that it’s helpful to consider ‘My mouth is an altar.’ The mouth, that place where speech is formed, can be treated as an altar where we lay down words in a thoughtful and sacred way. What words would we put on the altar? What words would be desecration of the honored trusting space between any two people? See if this is a helpful way to think about it for you. Wise Speech is one of the aspects of the Eightfold Path, and so works with the other aspects. What is the relationship between them? 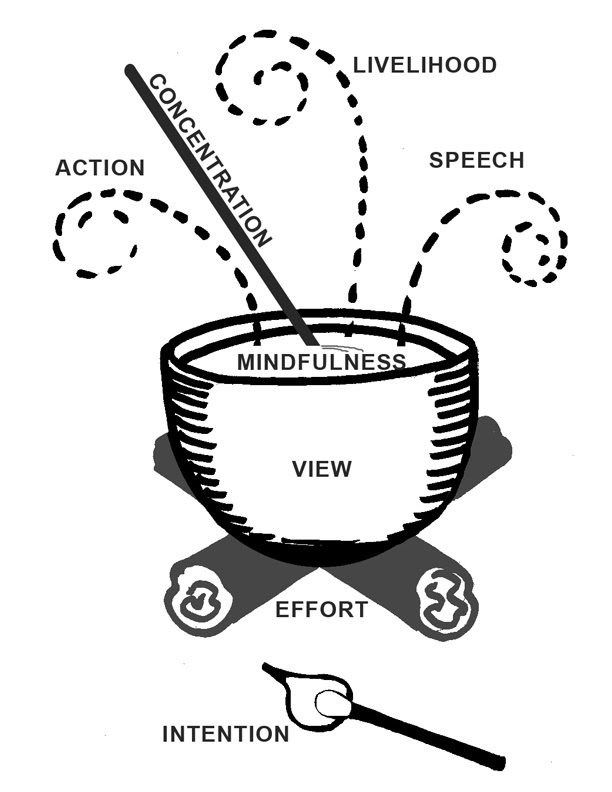 If we look at our cooking pot analogy, you’ll see I have drawn Wise Speech (and Wise Action and Wise Livelihood) as steam rising up from the pot of Wise View and its contents of Wise Mindfulness stirred by Wise Concentration. This makes Wise Speech and the others seem rather effortless. If all the others are in place, then these three arise. Is this true? Could be, but how often are all the others in place? When we find that we have spoken unwisely, or have a strong impulse to do so, we can look back to our intentions, our effort, our view, whether we’re being mindful, and these other aspects provide us with insight into how unskillful language came about. This is really practical and useful! One student noticed a striving quality to her efforts to connect with a friend, and a resulting difficulty with composing an email to her. This is such skillful noticing. We can apply the same questions we have been working with throughout our investigation: What is my intention here? Do I have an agenda? Or am I truly coming from my intentions to be present in this moment and to be compassionate with myself and others? Then we can look at effort and the rest. Let’s go through these three questions in a little more depth. This question can create a spaciousness and balance of thinking that feels like fresh air. Even if it gets us to alter our wording from statement of fact to an ‘I think that…’ opinion, it helps to make our speech wiser. But the question opens us to re-examining thoughts and beliefs that may never have been looked at before. If we haven’t really looked at it, how can we speak it as if it is truth? Are we simply parroting what we have heard? Where did we hear it? Is this a source we know to be trustworthy? How do we know that? ‘Is it true?’ is the beginning of our exploration. It behooves us to keep the exploration going, to examine assumptions, to question everything. But for most of us the idea of questioning what we believe to be true is threatening in some way. Why? Because we believe we are what we think, what we believe, what we hold to be true. This brings us back to Wise View and to the Five Aggregates we explored earlier in the year, that led us to understand that there is no separate self we need to defend or shore up. When we can sense our deep connection with all that is, how this human being life we are experiencing is impermanent, a fleeting conjunction of particles, a perceived segment of a much larger system of processes, and that our consciousness enables us to experience life in this moment as this seemingly-separate being with a skin-encased body, a name and other identifiers, then we can explore a simple question like ‘Is this true?’ with great freedom and curiosity. Because nothing in the answer threatens our being. What did the Buddha mean by this question? Is he suggesting that we should always be nice, don’t make a fuss, put up and shut up? Loving-kindness not about making nice in order to maintain some status quo. Instead it is rooted in a deep sense of loving kindness and compassion. So we ask whether we are speaking from Wise Intention or is there some murky motivation here? Are we saying something nice to appease or are we expressing truth with an understanding of the power of words to wound or heal, to cut down or inspire, to create antagonism or collaboration. We cannot understand the power of our words if we perceive ourselves to be powerless. The most powerful words in the world come from our parents. As children we craved approval and love, and were tuned into even the slightest hint of a tone of disapproval or dismissal.And we were aware when the words we craved remained unsaid. As adults we would do well to see our parents, whether alive or not, as mere humans prone to error like all others, with no instruction manual and little of what we now call emotional intelligence, and probably more than their share of challenges. We can divest the power we have given them without turning our backs on them. We don’t make ourselves impervious to their barbs by creating armor. Instead we recognize their torment and suffering, and feel compassion. May they be well. May they be happy. May they be at ease. May they be at peace. What does this have to do with our own ability to speak wisely. If we are parents, it reminds us that these words we use which we may not even think about — that may be throw-away words as far as we’re concerned, which come from a person who feels rather powerless perhaps, and certainly not capable of any real harm — are in fact received by our children, even adult children, as more powerful and thus more painful than we can imagine. Perhaps we have raised children who are well-balanced and capable, but we cannot assume that even they are not still in need of our approval and attuned to read more into what we say than we may have intended. So be aware! Whomever we are talking to, loving-kindness is an absence of the need to prove anything, correct or remake anyone. Kindness is not about satisfying our innate curiosity by asking nosy questions, but about taking an interest, and letting the other person take the lead in the conversation. Loving-kindness is universal, so our words are equally kind to everyone we encounter. What we have to say might be true, and it might be kind but maybe it’s an awkward moment to say it. For example, it might be true and kind to say “I love you’ to someone, but not in the middle of a business meeting. Or it might be true and kind to have a real heart to heart with someone, but not while they are in the middle of preparing a big dinner. Knowing when is the right moment comes from being attuned to the silence, being fully in the moment, and allowing the words to be a response to a spell of skillful listening. The right time reveals itself. Drinking. Some of us rely on drinking to get us through social awkwardness, but that release of inhibitions is really just a release of good judgment. If you can’t drink in moderation, don’t drink. If you drink to calm nerves, then find more skillful ways to address that concern — self-inquiry, looking at the patterns of thought that keep you in fear; and practice, such as joining Toastmasters to get past the nerves. Wit. Some of us so much want to entertain that we would prefer to be clever even if it cuts. Focusing on listening helps to remind us this is not a stage, we are not doing a routine. Gossip. Getting together with people who share common bonds with others often ends up by discussing those not present in a familiar but not always loving way. Wise Speech doesn’t talk about people, period. Their stories are not ours to tell. The answer to questions about absent family or friends is, ‘Oh yes, it’s too bad they couldn’t be here. But maybe you can get in touch with them to catch up.’ Of course that family member might not appreciate you referring people to them, so a vague ‘Oh they’re just fine. Thanks for asking.’ might suffice. This is difficult, especially for women who gather together to solve the problems of the world, or at least their immediate family members, and find relief from worry by hearing the stories of other people’s relatives who are even more dysfunctional. There is also a way in which families weave a valued and supportive mythology that has benefits that the Buddha might question, but that the elders of ‘the clan’ seem to have a biological imperative to weave and share. That aside, gossip usually leaves us feeling a sullied. Try a period of not talking in the third person and see if it doesn’t free you! As for supportive sharing of experience, there’s no harm in using stories, just keep the people involved anonymous. Generalizations, stereotypes. Without giving our words much thought we may find ourselves repeating things we have heard without question, or we might extrapolate a single incident into a judgment about a whole group of people. This is not skillful, since these statements by their nature are neither true nor kind. Desire to ‘be ourselves’. We have this idea that being free to say whatever comes into our heads is desirable. That anything else is censorship. Why? Do we feel entitled to move our bodies anywhere in space regardless of whether someone is already there? No. When it comes to action and to speech, we are in community. We may imagine a person — a friend or lover — with whom we can totally ‘be ourselves’, as in we can mindlessly blurt out whatever pops up. This only works if we have a set of disposable friends, whose feelings don’t matter to us. You might be able to think of a friend or two who you can be thoughtless in your speech and they don’t mind, but this only means that this is the kind of abuse they were raised with, and they interpret that as intimacy. We seek intimacy and sometimes rude cutting words make us feel at home. You might recognize that in someone you know, or in yourself. It isn’t wise or loving to continue that abuse. Secrets as intimacy. Shared knowledge feels like a bond, but building a separate fortress for two or a few is clinging to fortress mentality, just letting the ‘special’ people in. The only people who want in, however, are those who are trapped in believing themselves to be special and separate, in need of constant reassurance and admiration. Healthy relationships are built on a deeply shared sense of connection with all life and respect. Did you recognize any of these traps in your experience? Or others I haven’t covered here? You are not alone! These are challenging and it’s good to remember that this is all a practice. We all just do the best we can. All of these skills we develop are in order to reduce suffering for ourselves and others, and create loving-kindness, compassion and joy. This entry was posted in holidays, Wise Speech on December 8, 2013 by Stephanie Noble. Wise Speech rests in and arises out of a spacious peaceful, deeply connected silence. So I want to begin our exploration of of this aspect of the Buddha’s Eightfold Path with that silence. In class we rested in the silence of our meditation on a foggy morning that lent a cozy muffled silence to our practice. What comes up for you when I say ‘silence’? For many of us silence is not a welcoming, deepening sense of connection at all. Perhaps we are uncomfortable being left alone with our thoughts, so we fill our minds and our environment with noise to mask them. We may have had to learn to navigate in a dangerous world of potentially violent silences, developing hyperactive skills on reading the body language of parents, boyfriends or spouses, in order to protect ourselves or our children. This is a sad skill that so many women, in particular, have had to develop. The CIA has found that women have the heightened ability to read men’s motivations, to read the silences and see beyond the words. So women make up 50% of the staff at the CIA and the majority of its leadership. Some pretty hard-earned early life training those women had, no doubt. While a group of women together can certainly carry on a lively conversation, studies show that in social settings with both genders, women talk less. Women often hold back. Women often stifle themselves without men needing to request it. The culture has historically required it, and women, especially women of a certain age, still feel that unspoken demand to stifle ourselves. Why does this matter? The person who holds the proverbial talking stick is the one who directs or at least influences the action of the group. To be quiet is to go along with the program. To speak up is to take charge, to be a leader. Women of the 21st Century have at last taken the reins of leadership to a much greater degree than women have for many millennia! Hooray! 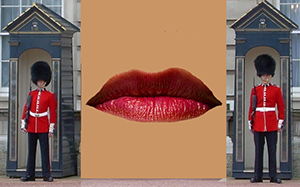 Given that newfound sense of expression, why would we want to be silent? We can see why our attitude toward silence is plagued with distrust, discomfort and fear: Silence is repression. Silence is a scary emptiness that will let the inner demons out. I understand this, believe me! And yet I keep championing silence, particularly a long silent retreat! Why? 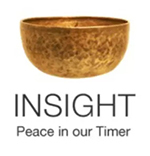 Because a silent retreat is a key part of the insight meditation experience. A daily meditation practice gives us a grounding in the skills to be present and to quiet the mind, but on a silent retreat, even the periods of not meditating are in silence and attentive to the present moment. In those periods when we are not meditating but are still very much in silence, there is a unique opportunity to see the nature of our thinking mind, to see the thoughts that repeat themselves ad nauseum. We can rail against the thoughts or we can develop a compassionate, curious but clear relationship. We might address a recurring thought with, ‘Oh you again! Haven’t heard from you in, gosh, twenty-two minutes!’ We can think about Siddhartha sitting under the Bodhi Tree greeting Mara again and again, saying, “I know you.” These recurring thoughts are Mara too. We can recognize them without going to battle with them. A simple noting is sufficient, and can short circuit the train of thought. If the thought is a plan, we note ‘planning’. Likewise, ‘memory’ or ‘regret’. We might develop our own little creative ways to cease struggling with thoughts and yet curtail them. For example, I sometimes think of the thought as a ribbon I tie into a bow that turns into a butterfly and flies away. This keeps the process light. We are so prone to being punitive, it helps to have a light-hearted method that keeps us from succumbing to antagonism. Only when we give ourselves an extended state of silence without much external stimulation do we begin to really see clearly the nature of persistent thoughts. We see their associative connections. We might notice that a sight or smell or texture triggered a particular memory that brought forth an emotion that caused a physical manifestation, such as tension in a certain area of the body. What useful information! We can apply compassionate inquiry and discover we have been operating on a totally erroneous assumption. This can be big life changing news that can liberate us and end suffering. Silence allows us the spaciousness of mind to see the weave in the fabric of our mental processes. That spaciousness in the environment, in the silence, the stillness of being, the easing of physical tension, the simple structure of the retreat schedule that takes away the constant need to make decisions or to get things done, all helps to settle our minds and open our hearts to the sweet rich quality of being. With that clarity of mind and compassion of heart, we are inclined to have insights that awaken us. So as scary as silence may seem to us, in fact when we give ourselves to it in this way, it proves to be the greatest gift we have ever received. This entry was posted in inquiry, retreat, silence, Wise Speech on November 17, 2013 by Stephanie Noble.